My friend Frances at Left-Handed Housewife is a wonderful author of juvenile novels. 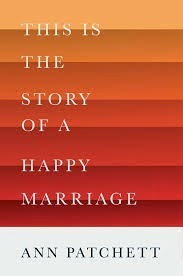 She possesses an intriguing and highly-entertaining writing style herself, but the other day she mentioned Ann Patchett, one of her favorite authors. Wow! I'm reading this one. GOOD! 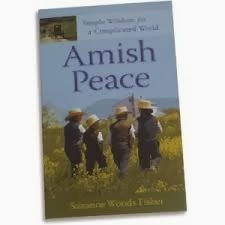 Tina at The Quiet Home is reading Amish Peace. The Kindle price is a steal! 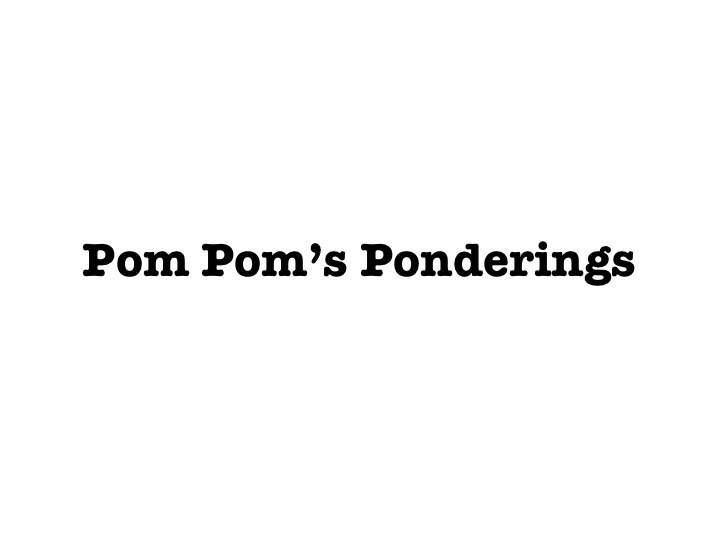 Yay for another great blogger's suggestion! Yesterday our school book fair began. Our librarian supplied a fiesta theme and served treats AND allowed early browsing for the teachers. I had never heard of the book above. 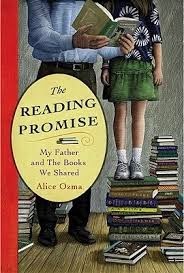 A father (a librarian himself) read aloud to his daughter EVERY NIGHT from the time she was in 4th grade or so until she left for college. The daughter is the author. Reading this book makes me hungry for more books! And speaking of book love, this photo is one I took when I was at our local public library with Birdie and Miss Bug. Isn't it cute? Everyone likes sitting upon toadstools. Now for the smiles! Look at The Mad Hatter's face! Ha! Look at Millie making a mess of my knitting! Ha, again! It's ALMOST geranium time! Smiles all around! Don't geraniums remind you of all things cheerful? They look so nice in clay pots and they are the perfect finishing touch in a clean kitchen. The bunnies are coming out of their underground homes. They are hopping about in our back yard when we get up in the morning. They just in time for the prelude to Easter. JOY! Here's one last giggle for you. Jenny took this cute photo of Plum Cake. I am home today because I am the Mystery Reader at Miss Bug's preschool. She doesn't know I'm coming. I think I'll wear my ruby slippers. There is snow on the ground this morning, so my Wendy house plans seem very unrealistic. That's okay! I'll play in the Wendy house during my spring break in April. The seed display is in place at the grocery store. I bought pepper seeds and sweet pea seeds. To get the very best sweet pea crop here in the high country, I plant around President's Day. I'll wait until the snow goes. Sigh. Eggs cups at the grocery store. I have no use for egg cups. I peel my hard-boiled eggs and eat them quickly. Egg cups are lovely though, don't you think? Here are the girls climbing high! It was warmer yesterday, even though the wind was howling, so we drove down to the elementary school to ride bikes. The bikes were cast aside in favor of the climbing equipment. My sweet neighbor Reve's grands were there, too! Yay! That's darling Emma having fun with Bird and Bug! The nice man who keeps his horses at Kelli's barn helped Miss Bug ride. Aw! I love the grocery store when it decks itself out for Easter. Three bunches for ten dollars! Yay! A Cream of Rice morning it is! I'm going to go upstairs and iron. My toes are cold. I wish you a few blue-sky days this week. Me, too! Here's my Bill talking to my parents a few summers ago. Aw. I miss my papa very much. This morning Bill is downstairs exercising on the Wii. He's toe-running around our family room and he's singing "Macho Macho Man" because he's listening to his iPod. SO CUTE! It reminds me of a birthday party we had for a high school kid 35 years ago. We were leading Young Life in a small SW Washington town and one of the kids (Alan) was a Baptist minister's son and he was FULL of enthusiasm. We were having the party for him (I'm pretty sure - it was a long time ago!) and I made pink punch in a big Tupperware bowl and added floating candles that had been a wedding shower gift (see what I DO remember? Ha!) Anyway, Alan started singing and dancing with glee (I love it when teenagers are happy!) and he sang Macho Macho Man. I thought it was SO funny! Alan went to West Point after he graduated (I'm pretty sure - again, my memory is fuzzy). Pretty Macho in a good way, right? I grew up with a beautifully strong mother who was a stay-at-home mom/run your husband's business/take leadership at church and servanthood seriously type of person (and still is!) I never doubted that women could do amazing things. I never doubted that men who love women are precious and wonderful. During that same time period, there was a group of adults who became threatened by our ministry to the local high school kids. Because we lived in a house owned by the school district (the district rented it - we paid rent) we had to move out after some community members complained. We did and we actually moved into a more comfortable rental, but I remember talking to my dad about it on the phone. I don't remember his exact words of encouragement but they were something like, "Don't worry, Honey. It's okay. They can't hurt you." He was so right and his strength and confidence sent me right to the Father of the Universe. God continued to bless our love for kids - HUGELY! My dad was a man's man. My husband is also strong and courageous (and very gentle, too). That's why I think it's so sweet that he's singing Macho Macho Man. Thank you, Jesus. I wore flip flops to our school work day. It's a tad early for flip flops. Temperatures are expected to rise to the 60's today and the days are longer. Garden dreaming is a lovely sensation. This year our garden is going to be "everything bright" like the zinnias below. I ordered some polka dot tin dishes for the Wendy house. I ordered a little snack set, too. Bunting is needed and I'm also going to print and laminate some photos of the grands to tack on the walls. A clothes line? Yes. A stone path to walk in the flowerbed? I think so. Plum Cake is big enough to busy herself inside the tiny house. FUN! The dishes above were a mistake for the Wendy house. Yes, breakable. I've rescued a good number of them and they are safe on Granny's shelf now. I'm reading a sweet book titled, Knitting by Faith written by Julie LeeSong Norman. I'd like to knit more, but I do enjoy reading about knitting VERY MUCH. Do you? Here are my garden store purchases from last year. I must remember not to buy too much at once. It keeps the "have to's" at bay and feeds the "want to's". I hope I'll find LOTS of purple and pink petunias this year. The parsley is doing something green already and the iris are popping up. YAY! We'll have a few more snows, I'm sure. This growing season I plan to keep a garden journal and a nature journal. Do you? Time for breakfast, lunch packing, and driving off to school. I pray your day would be full of inspiration and grace. Goodnight, Moon. Isn't our moon absolutely PERFECT? I am so thankful that we only have one moon, aren't you? This morning I am waiting for the sun to shine. NOT YET. Poor little gnome! He's on the lookout for signs of spring. This is what I mean by icebergs. Sticky trees with a grey-sky backdrop . . .
Bare ground, waiting for staging of a sweet Peter Rabbit garden this year. Yes, carrots, radishes, peppers . . .
Before Bill had his hip replaced, he decided to leave the garden hose outside (instead of in the garage) which is very unlike him. His new hip is working so fine! I'm so grateful. Here's a fuzzy little tea party waiting for you. Sparkly! Here are our two oldest grands. They are having a quick bowl of cereal at our house before they leave to paint pottery, have lunch, and enjoy a pedicure. Birdie chose this instead of a birthday party. Cousin time. They adore one another. I think it's funny that they are going for pedicures because when they arrived this morning, they both had serious bed head hair styles. Granny got out the brush. Here's wishing for a little sunshine today. 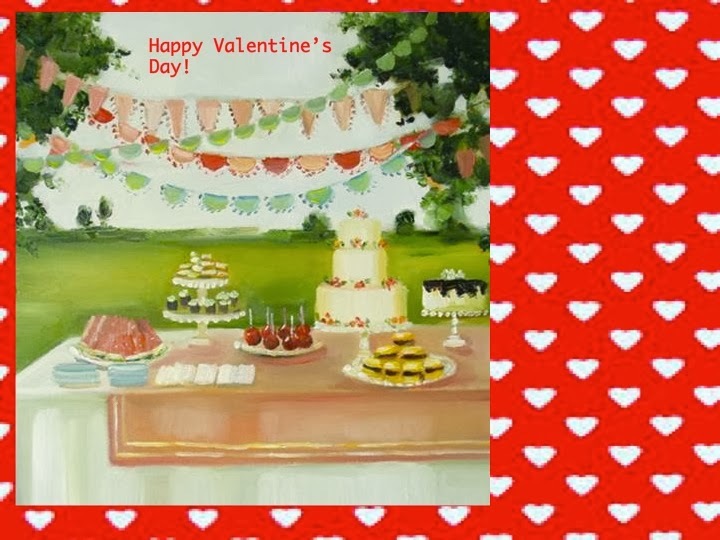 It's the LOVE day! It's the LOVE day! I wish you BIG HUGS and an abundance of chocolate. Buy some for yourself, for heaven's sake! My niece borrowed my bridal veil (and wore it) and she recently sent it back to me. Isn't it pretty? I hung it up in the living room, so I could view it for a day or so. Even though we have a HUGE population of bunnies in our neighborhood, I'm going to plant carrots this year, peppers and cucumbers, too. Yes, we still have icebergs, but the temperatures today are supposed to be in the 50's. REJOICE! The other day I received REAL MAIL! My art buddy Lisa sent me some treasures! Let's keep praying for the UK. It's raining and flooding so much. Keep them safe, dear Lord. Also, the snow is getting a little old in the USA. There are dishes in all the main rooms of our house, so instead of tediously dusting, sometimes I simply gather them up, put them in the dishwasher, and replace them on the shelves and tables when they are shiny and clean. Doing that AND washing sheets, towels, and quilts feels "housey" to me. Looking at berries and summery vegetables is making me LONG for spring. I hope the weatherman is right and we are blessed with some iceberg-melting 50 degree weather later this week. When I return home late this afternoon, I'd like to used my freshly washed polka dot teapot for an entire pot of tea. Quite honestly, I'm usually pretty care worn by the end of the school day, but I shall take my vitamins right now and pace myself. Here's to a LOVE month full of tipping teacups and dreams of spring! Last weekend it was colder. We have temperatures in the 30's now and Kelli says it feels like a heat wave. I am still cold. I am wearing a wool cardigan over my pajamas. Last weekend before the Broncos were beaten so badly, I met my old soccer friend for coffee. When our girls played soccer and we had to travel to other states, we roomed together. We've known each other for a long time. I like her brown twinkly eyes and her happy laugh. This morning I'm meeting Kelli and Jenny for breakfast so we can celebrate Kelli's birthday (a day late). FUN! A question for you . . . what form of chocolate are you going to eat this week? It's the time for goodies of the chocolate kind.